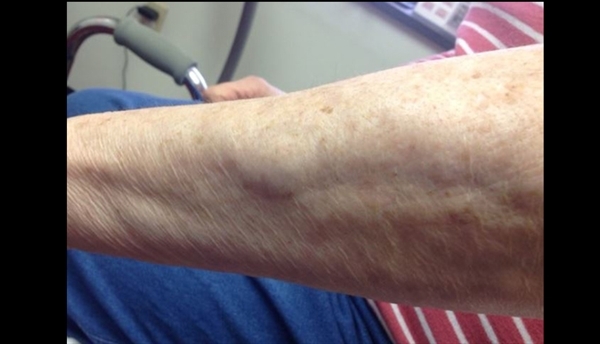 A 70-year-old man requests treatment for a lesion of his left forearm. The growth has been present for at least two years and has been slowly increasing in size. He gives a history of hypertension and hyperlipidemia. Examination reveals a 3-cm nodule that is not fixed to underlying tissue. Pressure elicits minimal tenderness. No similar lesions are noted elsewhere. Rare variants include the cellular3 and infiltrative4 subtypes. Surgical excision is curative, and recurrence is uncommon. Belcher RW, Czarnetzki BM, Carney JF, Gardner E. Multiple (subcutaneous) angiolipomas: clinical, pathologic, and pharmacologic studies. Arch Dermatol. 1974;110(4):583-585. Howard WR, Helwig EB. Angiolipoma. Arch Dermatol. 1960;82:924-931. Hunt SJ, Santa Cruz DJ, Barr RJ. Cellular angiolipoma. Am J Surg Pathol. 1990;14(1):75-81. Mayooran N, Tarazi M, O’Brien O, Hinchion J. Infiltrating angiolipoma of the chest wall: a rare clinical entity. J Surg Case Rep. 2016;2016(1).